Marshmello is an American electronic music producer and DJ. His stage name is a playful misspelling of marshmallow, reinforcing that name by wearing a custom marshmallow helmet that has a smiley face on it. This helps him conceal his identity like other electronic DJs such as Deadmau5 and Daft Punk. Known for his high profile collaborations with artists like Khalid, "Silence", Selena Gomez, Shawn Mendes, and Bastille, Mello has become an instantly recognizable force in pop music. The song "Friends" is another collaboration of his, this time with pop singer Anne-Marie, and was released in February of 2018 as part of her debut studio album, Speak Your Mind. Just two friends and nothing more. This song is all about how Anne-Marie does not want to be anything more than friends with this guy she knows. She’s made it perfectly clear that he is deep in the friend zone and he’s never getting out. This is a highly relatable situation that plenty of women have found themselves in, and this may give guys who feel victimized by the friend zone a new perspective on why they’re in there in the first place. Marshmello has quickly proved that he knows how to make a catchy, uptempo pop beat, and that’s exactly what he’s created here. Anne-Marie’s vocals are also pitch perfect, and she switches up her delivery enough throughout the song that it constantly feels fresh and new. The hook is incredibly infectious, and the counting that she does plays a big part in that. Anne-Marie’s green high top chucks really pop in this rubber ducky room. This music video is actually one of two music videos that were released for this song. While the other music video focused on Anne-Marie in a sorority house and Marshmello as the house’s live in maid, this video is much more lowkey, and showcases Anne-Marie and Mello in some brightly colored rooms that feature some cool visuals. 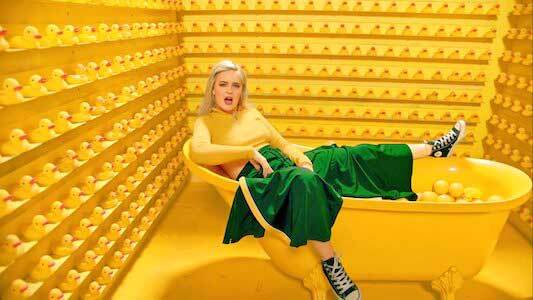 Anne-Marie wears green high top chucks throughout this version, and their striking color contrasts well against the background of the bright yellow, rubber ducky filled room she spends most of the video in. This music video may be simpler than the other version, but that actually helps it fit better with the lyrics of the song. This video puts a greater focus on the relationship between the guy (Marshmello) and girl (Anne-Marie), and shows how his feelings have created a schism between the two by separating them and placing them in topsy turvy rooms. This also also a much more aesthetically pleasing video, with its colorful palette and interesting rooms creating a bunch of great visuals. Falling in love with your best friend can turn your world upside down. Use the links below to get yourself a new pair of green chucks.